The Robertson Creek Ranch is a fantastic and unique ranch with live water and incredible wildlife. It is high-fenced, and the beautiful luxury home overlooks the ranch in all directions from a hilltop with long vistas. 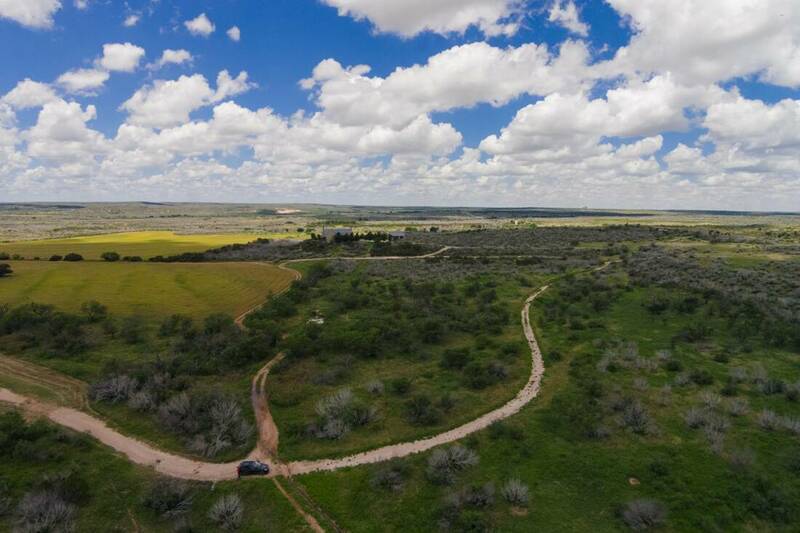 This ranch is unique because it is ideal for the entire family, and in addition to hosting all of the traditional Texas sporting game species, it is also a year-round recreational mecca with great fishing and exotic game opportunities. Water: This ranch has extraordinary water, with a live-water chain of lakes spread out over 2.5 miles of both sides of Robertson Creek, and over 1.5 miles of both sides of Cas Russell Creek. The lakes are stocked and managed and provide excellent fishing year round. The creeks are spring fed, plus there are 11 active water wells (6 electric, and 5 windmills) that support the wildlife or livestock needs on the ranch with flow rates of about 40-75 gpm. There are also a handful of stock ponds throughout. Wildlife: This ranch is under a Managed Land Deer Permit (MLD) Level 3 program with the TPWD, allowing whitetail hunting from October through February. 200 whitetails with top genetics were released onto this ranch in 2013. The exotics include Axis, Fallow Deer, Gemsbok, Red Sheep, Aoudad, and Blackbuck and these can be hunted all year long. Of course, this ranch has outstanding quail, turkey, and dove hunting as well. Needless to say, this ranch is loaded with wildlife! Improvements: The main lodge has 5,000 s.f. and was constructed in 2000. It is a luxury hunting lodge with 5 bedrooms, 5 baths, a 3-car garage and an equipment room. There is an outdoor fire pit that is perched on a hilltop with stunning views of the fields surrounding it. There is also a rock stone hunter/guest cabin with about 800 s.f., 1 bed and 1 bath, and a swimming pool, outdoor fireplace, hot tub, and a nearby sporting clay range and rifle range. The ranch manager’s home is roughly 1,500 s.f. with 2 bedrooms and 2 baths and is in a great location on the perimeter. Nearby are a walk-in cooler and processing area, as well as 3 horse stalls, a tool barn and garage, horse stable with round pen, and a turn out pen. There is also an equipment barn that is 5,000 s.f. in size and has four adjacent 14-ton corn dispensers and plenty of capacity for protein and corn storage. The entire perimeter is high fenced, and there is also a 32-acre soft release pen. Robertson Creek comes complete with 13 hunting blinds, 15 commercial grade protein feeders, and 13 corn feeders which include six 2-ton size feeders. There is also additional infrastructure (pens and related facilities) in place for more intensive deer management should a prospective buyer so desire. Habitat: The terrain on this ranch is superb with over 140′ in elevation change, and the topography lends itself to excellent spot and stalk hunting opportunities as well. This ranch has incredible wildlife habitat and the cover is what thriving wildlife populations desire, especially with the diverse creek bottoms. There are many varieties of trees, oaks, pecans, elms, mesquite, hackberry, and juniper, mixed with a variety of various browse plants, and native species of brush and grasses. It has mainly loamy soils with some Dermott areas, and 5 oat fields that range in size from 10 to 60 acres. Location: The ranch is 18 miles South of Sweetwater, and just West of Highway 70 in the South Central part of Nolan County. It is access by a paved road, and an electric entry gate. Minerals: The seller owns a nominal amount of minerals, which can be conveyed with an acceptable contract. There is one marginally-producing well in the back corner and the gauge checker uses a back and separate gate.